NDIS Government Legislation gives care recipients the right to have choice and control over who provides their care. Local and global research and experience has demonstrated overall better outcomes where choice and control can be exercised by care recipients. During a planning meeting, NDIS care recipients should be asked how they would like to manage the payments in their plan, choosing one or a combination of three options. NDIS Management. This is the default option, however, only NDIS Registered Providers may be engaged at the prices specified. Funding is paid directly to the provider. Plan Management involves engaging a registered Plan Manager (similar to an accountant or bookkeeper) who receives all care recipients’ invoices, claims monies from the NDIS, pays the invoices and gives financial reports to care recipients. NDIS pays Plan Managers for this service; there is no out of pocket cost to care recipients. Self-Managed care recipients manage all provider invoice claiming and payment themselves. It is similar to managing personal expenses, except the funds need to be kept separate. Plan Management and Self-Management are similar in terms of maximising choice of providers. Plan Management has the benefit of providing a free Plan Manager for all administration and compliance. Self-Management has the advantage of not being subject to price controls. There are hourly and unit price limits for NDIS and Plan Managed providers. 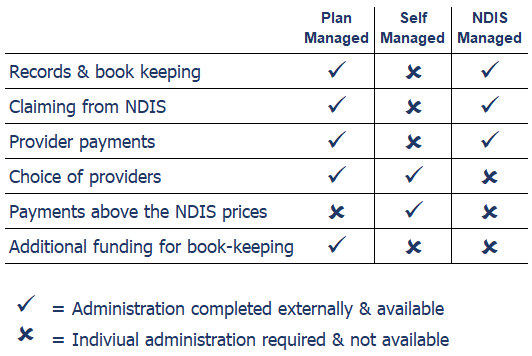 The NDIS provide additional funds for a Plan Manager in Plan Managed NDIS plans. The funding is permanent, guaranteed (cannot be denied) and can be requested at any time. Existing NDIS plans will require a plan review to include Plan Management if it has not been previously requested. Plan Management services can be terminated like any other service, typically with two weeks’ notice and another Plan Management service engaged. Self-Management requests may be denied by the NDIS where there are doubts regarding a care recipient’s ability to manage their NDIS monies and comply with the legislation.